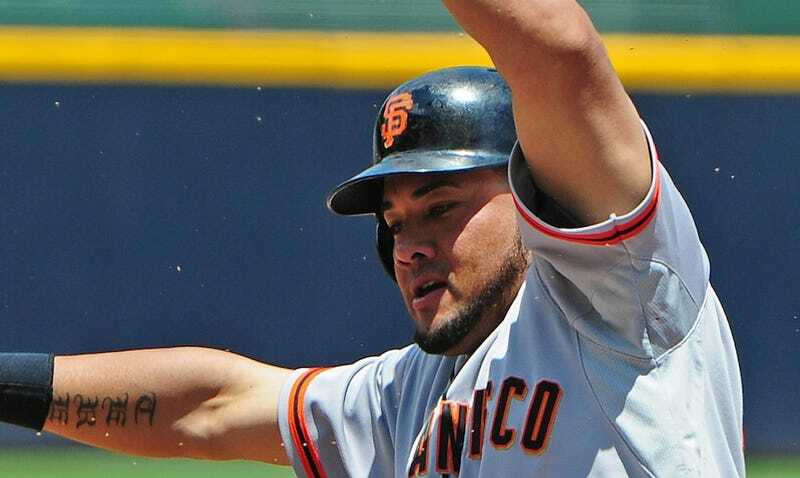 The Giants' Melky Cabrera wowed us this year. That doughy loser who couldn't cut it in New York or Atlanta managed to hit .346/.390/.516 in 113 games, and for good measure, he won the All-Star Game for the National League. But that will be all for him in 2012, because Cabrera, MLB says, was pumped full of foreign testosterone. And there's no Kenosha fridge ex machina coming to save him. There are two silver linings for the Melkman, though. The first is that he will be available to play in the league championship series, should San Francisco make it that far. He has to miss only the team's first five playoff games. The second is that he can still win the batting title, should Pittsburgh's man Andrew McCutchen dip and no one else rise. There was some chatter on Twitter about Melky falling one plate-appearance short of the minimum required to qualify for the batting title. That's true, he did. But for the unqualified MLB just adds imaginary outs to get one to the minimum. So, for the chase's sake, Melky will wind up with a .34562 batting average instead of the .34641 figure he has now. His line remains in good shape. That big contract extension? Not so much.